As I’ve stated in one of my previous posts October is my favorite month, and it’s not just the temperatures cooling off and the changing of the leaves, or the apple cider, or the autumn festivals, or warm soup on a chilly evening. It’s time for the return of the Nelson’s Sharp-tailed Sparrow (Ammodramus nelsoni), as they pass through our area on their way south. These beautifully colored sparrows are so different from our everyday, run-of-the-mill little brown sparrows that we as birders need to use extra effort to seek them out for ourselves. 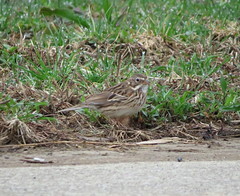 A small , short tailed sparrow just measuring 5 inches with the mix of rufous, orange, gray and brown help camouflage this bird nicely as it skulks deep within thick grasses, reeds, and cattails. Easily flushed from underfoot as you hike along, their weak flight low to the ground is a good indication to most Ammodramus species. And such was the case last Saturday morning as I drove to Ellis Lake as word got around that the “Nelson’s” are returned. Completed in 1849, the Miami-Erie Canal once flowed from Toledo to Cincinnati with a depth of 4 feet and 40 feet across at water level with a 10 foot wide towpath. Remnants of this once grand canal is still evident at Ellis lake and the neighboring Gilmore Ponds Preserve. Now with the passing of time it’s no more than a small stream that runs parallel between Ellis lake and the train tracks. 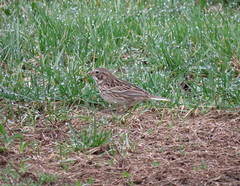 However enough water still flows through the canal that portions of it still over into a agricultural field creating a small riparian area perfect for Nelson’s Sparrows, and last year a LeConte’s Sparrow. This water course was my final destination. If it wasn’t for previous foot traffic indicating where to go, you’d be following a deer path through some tall weeds as you picked your way in the direction of the canal. As you near the area where the Nelson’s were located water appears on your right and in front, which forces you to turn left and our perfect little patch of Nelson habitat. As you walk along the vegetation is no more than ankle to knee high, and the ground soft from the small area of water. It was time to put on my serious birder face and focus on the bird. There was a nice steady breeze which was bothersome. Since Nelson’s skulk around in the dense vegetation ‘ll normally focus in on unusual twitches of cattails, grass. However with this breeze we already have enough movements that missing something unusual is a good possibility. As I crept forward I spooked a small bird with that weak flight. It dropped into a clump of cattails about 20 feet in front of me. I stopped and waited, and waited. Some small cattails twitched about. I focused into the clump and was able to see it’s little head and nothing else. Taking a picture was out of the question. Then it flew across to the other side of the water where I was able to get some good looks at it, just not any good photographs. This area is about 50 yards away from the first photograph. It was here that I saw 2 Nelson’s and 1 Henslow’s Sparrows. 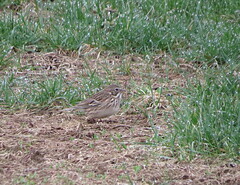 If you look real hard you’ll see the Nelson’s Sparrow through the sticks. These were the views I was dealt. I spent a couple of hours walking back and forth but as the morning waned into afternoon all bird activity seemed to shut off like a faucet. Time for lunch! Have you ever been found guilty of being a “Twitcher”? And if you’re not sure what I mean by this here’s a good definition I found on the internet while composing this blog post. For myself I am guilty as charged. There are some birds that were so elusive to me I started to believe they didn’t exist at all. “Can you say Whimbrel”. I’ve chased this bird multiple times without success, but it wasn’t till my recent trip to California was I finally able to tick this bird onto my life list. Another good example was the Yellow-headed Blackbird. Always seen sporadically during my multiple stays in northern Ohio during spring migration, I would always keep my ears open at the idle chatter from other birders just waiting to hear the name mentioned. A relatively rare and elusive bird for Ohio, I’ve been know to travel at slightly elevated speeds to stake out locations of recent sightings. It wasn’t until a few years back while on the boardwalk at Magee Marsh when word came to my ears of one being seen on the auto tour at Ottawa National Wildlife Refuge was I able to score another lifer. When a Garganey showed up at Fernald Preserve in 2011 (45 minutes from my house), Twitchers from all over the country flocked to the area just for this rarity, as did myself. When the bird hung around for several days I was able to treat a group of Boy Scouts who were attending my Bird Study Merit Badge class to this awesome bird. So if you think about it we all have a little bit of “Twitcher’ in us. I think this is one aspect that makes bird watching so much fun. The exhilaration of the chase and finally seeing the bird is very exciting. Twitchers from England I’ve heard can really be overly obsessive when it comes to rarities. To see them in action I’ve pasted a URL of an hour long video about English Twitchers. I found this to be really entertaining and I hope you enjoy it. A spotting scope and tripod are two items not every birder can own. They run from being affordable, to uber-expensive, and every price range in between. And if you happen to own one I’m sure you’ve fallen victim to “Spotting Scope Fatigue”. A temporary numbness and localized pain in either both or one of your shoulders from carrying your burden all day long in the field. How many times have I opened the rear hatch of my car and stare at my spotting scope just lying there. You know you’re going to be gone for several hours and the thought of carrying your scope hour after hour makes you pause and reconsider. You know if you don’t take it with you, you’ll curse yourself as you scan that mud flat at all those wading birds you can’t ID because you left your scope all alone… in your car. You spent all this money on your scope, so you feel obligated to take it along. For myself, and I’m sure others would agree, the shifting of the scope from one shoulder to the other is something we as birders need to get used to. And if you happen upon a bird you either have to put the scope down before bringing up your bins, or you just bring your bins up and hope you don’t loose your balance. Either way it’s not the ideal. You and I both know that having two hands on your binoculars as you focus in on a bird is far superior than one hand. Jon and I always thought that there should be something out on the market like a backpack system for your scope and tripod. And there is. I stumbled upon the Mulepack by CleySpy out of the England while searching the internet. It was exactly what we were looking for, but we were a little hesitant on pulling the trigger. The overall cost was about $73.00 dollars, and not knowing what the shipping was going to be we waited. Then a wondeful thing happened. Jon’s wife and Mother-in-Law went on vacation to England. And on top of that he found another company which offered a slightly cheaper pack at $68.00 dollars with no shipping since they would be bringing them back to the states after their vacation was over. How sweet is that. So now I’m a proud owner of a Scopac tripod carrier. And as you can tell by the photo, it fits and works wonderfully. Plus it has a small zipper compartment for some loose items or a small field guide, and a net pouch for a water bottle. The shoulder straps are adjustable and it also has a sternum strap. For an item such as a spotting scope and tripod we as birders really don’t have too many options for carrying our priceless gear. And as I grow older creature comforts are really high on my list. And shoulder fatigue is one less thing I need to take aspirin for. Autumn, specifically October is both my favorite season and month of all time. And even though I was married 31 years ago this month, the fact remains whether I’m married or not this is my favorite time of year bar none. The landscape is changing, from green corn fields to golden brown rows of ripening field corn. The soy beans are turning golden as the days grow shorter, as well as the leaves on the trees. We’re changing from shorts and T-shirts, to jeans and sweaters. Soups are served warm to the table weekly, as we throw open the windows and turn off the AC. Change is good. It keeps us in balance with nature. And with these changes comes the much anticipated Winter Finch Report from our friend up north, Ron Pittaway. Every year at this time birders wait for October and for Ron Pittaway’s look into finch movement during the fall and winter. 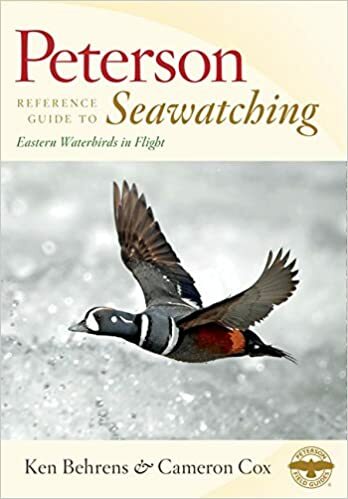 A field Ornithologist from Ontario Canada, his highly respected, and accurate reports help us birders as we go into the field, or sit inside our warm homes, and watch the birds. Now I could do a simple copy and paste of his report, but it would be simpler to just add a hyperlink to his report. And for those birders in the Midwest, Red-breasted Nuthatches are showing up in quantity.